Home » Blog » Products » The Stihl MS500i - Fuel Injection is coming! the latest stihl technology is coming! 2019 is set to be a huge year for chaisnaw development, and as always Stihl will be a part of it. Introducing the new MS500i, the worlds first petrol chainsaw with electronically controlled fuel injection. With no need for a carburettor, the MS500i will be light, more efficient, and produce lower emissions than a standard saw, something we should all be considering in the modern age. This doesn't mean that it comprimises on performance, accelerating to 100km/h in 0.25 seconds, and producing reliablity day in, day out. The sensor controlled fuel mixing means that you;ll get optimum engine power at all times, all while fuel levels are monitered so that you're not burning though petrol unnesecarily. The fuel is precisely delivered into the crankcase and drawn into the combustion chamber alongside clean air through the long life HD2 air filter. Starting the saw is very easy too - there's no start switch so you just need to press the primer bulb for a cold start and pull the cord, then press the stop switch to turn it off. Simple. Coming in at 79.2cc, the MS500i will deliver 0.8hp more than the MS462, whilst being just 0.2kgs more and keeping the overall compact size. This will make the saw extremely easy to use for long periods. It will also feature a very light flywheel which will deliver lower gyro forces, meaning that the saw won't twist in your hands, therefore giving you greater control. 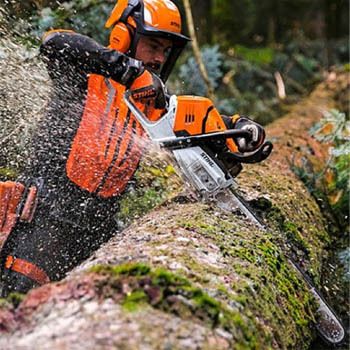 Some of you may have seen the MS500i at the 2018 Arb Show where Stihl had it on display, but this year we are set to have stock available to sell which we will bring with us to the Arb Show at Westonbirt Arboretum, so get May 17th/18th in your diarys early doors. This will be the first chance for many of you to get your hands on what is probably the most anticipated saw of a generation. Fuel injection is nothing new for Stihl, some of the Cut-Off saws have been running it for years, but this machine has been thoroughly tested to the limit anyway in environments where it will be used, just to make sure that this saw works straight off the shelf for you. Be sure to keep glued to our social channels for more info on this saw as we get it, and details on pre-orders.